This winery (Croatian: vinarija), is the biggest producer in the area. They are able to churn out 1.5 million liters of wine a year, which is more than all the other producers combined. Of course, they’ve had something of an advantage, being that they were the former Communist cooperative for the region when Croatia was part of Yugoslavia lurking just to the left of the Dingač tunnel in Potomje. The winery was heavily built up to accommodate massive production, seeing as how it was forbidden for the local growers to bottle and age their own wines, thus making for only one outlet in the area: Dingač Winery. Today, despite the free market economy taking hold, some 290 families are cooperants in the Dingač production facility. They produce a large swath of wine levels, starting at sub ‘stolno’ bulk wines where you can fill up your own bottle from a tap in the tasting room, to a proper Dingač (the Dingač Winery – Dingač and yes, this is confusing to many people). Nearly all their production is centered around reds and Plavac Mali reds at that. The basic Plavac has a very dry nose and body. It runs a bit tart and tannic as well as being a bit crusty, making it more suitable to drink with food. 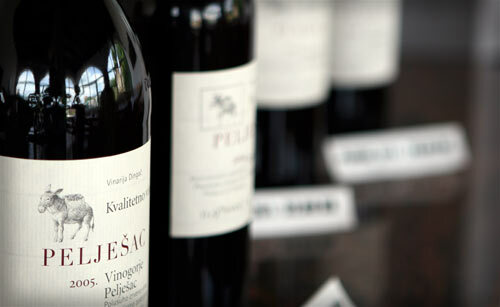 The Pelješac is similar to the Plavac, but a bit more complex, taking in some light blackberry flavors and aromas. The Postup gets even more interesting with mint and licorice aromas to the nose that allow more of the ‘Plavac nose’ to come through. The berry elements come out even more and the body is quite smooth. The finish has a nice pucker to it from the tannins that leaves a pleasing taste on your palate. The Dingač is their highest grade wine. The nose has wonderful tobacco and raspberry aromas to it that carry in to the body and through to the finish. The dry qualities to the texture are smooth and even through the wine. The wine is considerably more earthy than the other Plavacs that Dingač offers and is a good choice for all around drinking. The 2009 “Pelješac” on the other hand is wonderful example of just how true a Plavac Mali can be the to the locale and we reviewed it previously. In Croatia, these wines are easy to find as just about every market from Dubrovnik to Pula to Zagreb and Osijek will stock them. You can even find them in Sarajevo and Mostar despite the burgeoning Bosnian wine industry. While generally lacking in the intricate flavor you’ll find in the smaller, craft wineries, the medium to high-end bottles are definitely worth picking up if you’d like something to go with your meal on the balcony of your vacation pension. We talk a great deal more about Vinarija Dingač as well as other Croatian wineries in our Dalmatian wine guide.